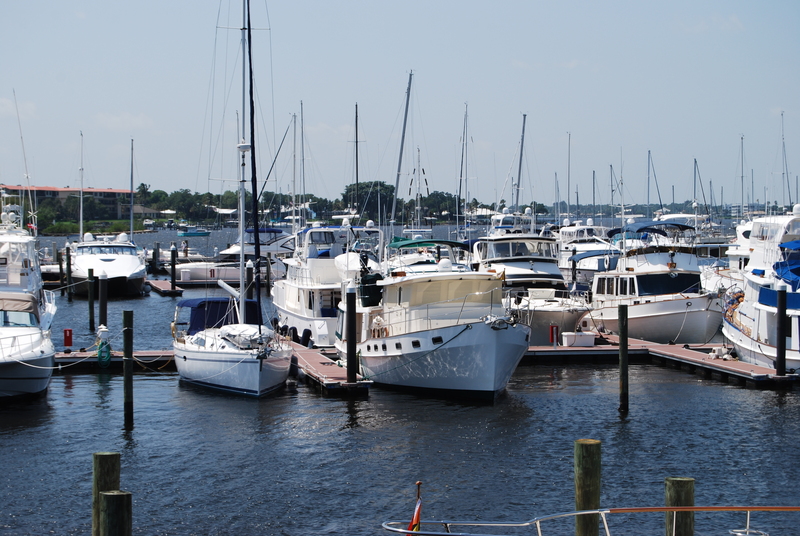 Sunset Bay Marina in Stuart, Florida has been our home for the past month. At the base of the Roosevelt Bridge, this city operated marina is first class. 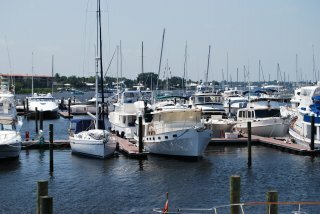 With over 200 floating slips and 70 moorings, many boaters call this their winter home. It is within walking distance of the small downtown with it’s many nice shops and restaurants. 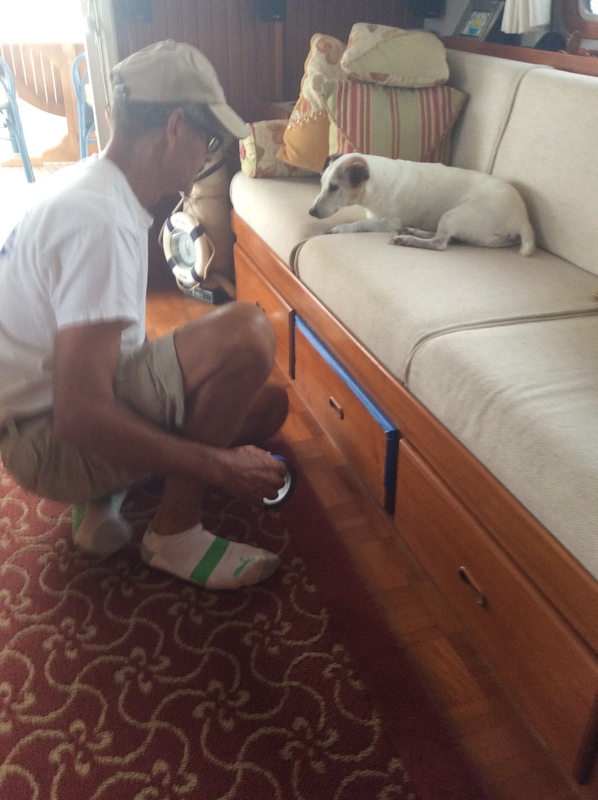 We came into Stuart to do a variety of preventive maintenance chores on our boat. We also had to go back home to Tennessee for a week so it was a perfect time for master woodworker Phillip to refinish our interior parquet floor and also do some cosmetic work on the interior wood. 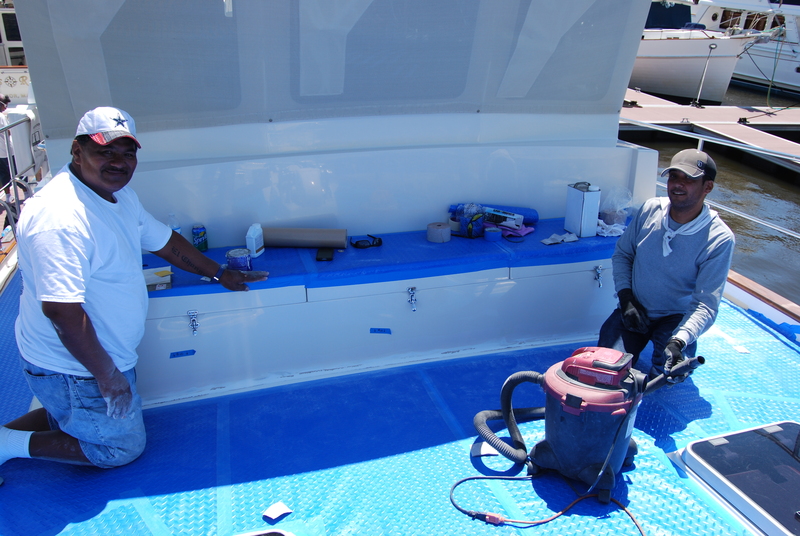 Additionally, with us gone and out of the way, we scheduled Angel to apply two coats of Awlbrite Clear over our exterior varnished cap rail, fix some gel coat cracks and mount two cleats on the dive platform. We were a little unsure about using this two part Awlbrite on the cap rail. We have used a product called Epifanes since day one and have always been happy with it. It seems everyone is now using this new generation of varnish and we are told it will last much longer. It turned out to be a good decision. Our cap rail has never looked better. 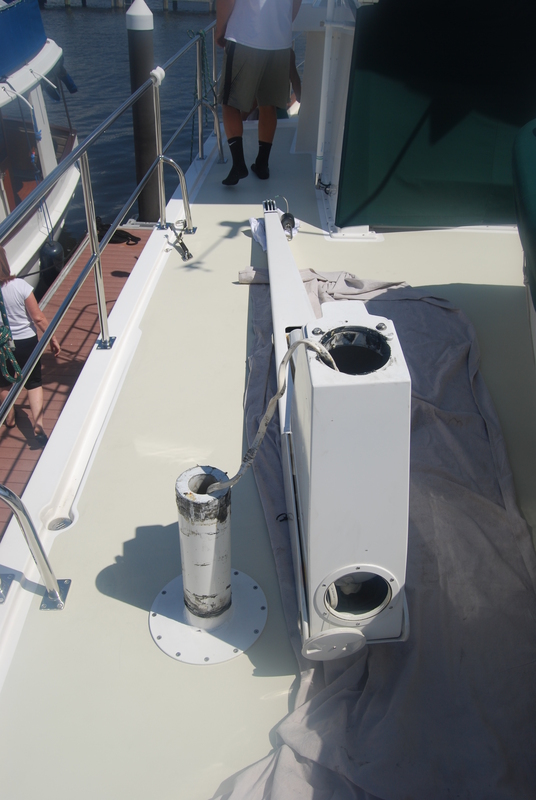 While we were gone, we also had Will, master welder, make us two plates out of stainless steel to properly mount our new Rocna anchor and lengthen a stainless wall handrail. Upon our return from Chattanooga, our electronics guru,Scotty, had a long list of tasks to accomplish with Jeff helping. 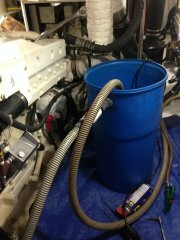 This included: changing the generator belts, fixing two hydraulic leaks with special washers, change the hydraulic oil and filter, change four engine heater hoses along with new coolant, running coax cable to the master stateroom TV, install a new ship main computer with all of the navigation software, repair the holding tank vent, remove the davit and grease the post, install a new water maker diverter valve and fill it with storage fluid. The new computer install turned out to be more of a challenge than we anticipated. After many phone calls with Nobletec and WxWorks, the navigation and weather programs finally worked in sync. A surprising complication was the generator. While changing the belts, Scotty discovered a cracked engine bracket that holds up the clutch and hydraulic pump. It was cracked at the welded joint and if left undiscovered would have failed and the entire unit would be inoperable. Will was able to re-weld it exactly and it was reinstalled without additional complications. If we hadn’t done preventative maintenance, this would have never been discovered. It just goes to show you how important it is to keep up with things on a boat. 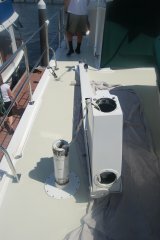 Andrew from Barnacle Busters came one day and spent several hours flushing the engine and A/C systems with a special acid to remove accumulated marine growth. We had never done this as we had been in fresh water for the past six years. The systems were dirty and should run cooler now that they are clean. Whew! We didn’t think we could get it all done and have time to sea trial the boat to make sure everything worked. With the help of special cookies, peanut M&M’s, home cooked meals and strong coffee to keep Scotty going, we got everything accomplished before the end of the month. 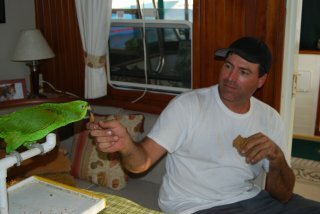 Nate especially enjoyed seeing Scotty each day as Scotty would always share his cookies with him. Our final task was to have Dave the Diver scrub the hull. The brackish water of the St. Lucie River is a nursery for many fast growing marine organisms. With the boat sitting stationary for the last month, growth has accumulated incredibly quick. It doesn’t take much growth to affect performance and prop vibration. 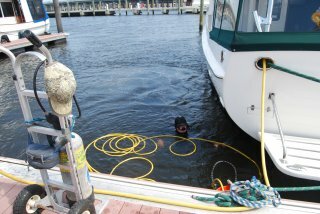 The divers have been on the docks everyday scrubbing boat bottoms. They stay very busy and did a great job. Idyll Time ran super smoothly afterwards. On Tuesday morning, with the threat of rain, we shoved off from the dock and headed north to St Augustine, our next destination for the entire month of May. This entry was posted on May 3, 2015 at 2:53 pm. You can follow any responses to this entry through the RSS 2.0 feed. You can leave a response, or trackback from your own site.